Aliso Niguel and Santa Ana high schools made national headlines in September, but not in a good way. 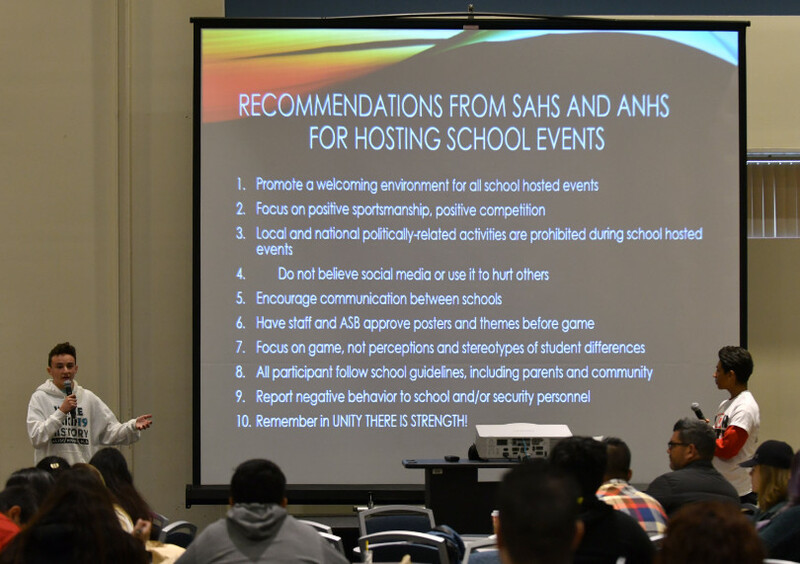 Santa Ana High School’s principal Jeff Bishop posted on social media that his students were insulted and offended during a Sept. 8 football game at Aliso Niguel High School when students chanted “USA…USA” when their team won and holding up “Trump 2020” signs and campaign posters. 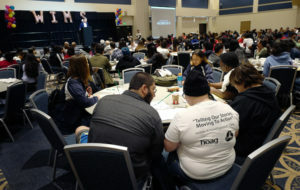 On Friday, Nov. 16, more than two months after this local incident was held up as the example of how a polarized political climate had spread its tentacles into school campuses, students from both high schools came together to talk about how a football game got them thinking about perspectives, racial stereotypes and sensitivity. 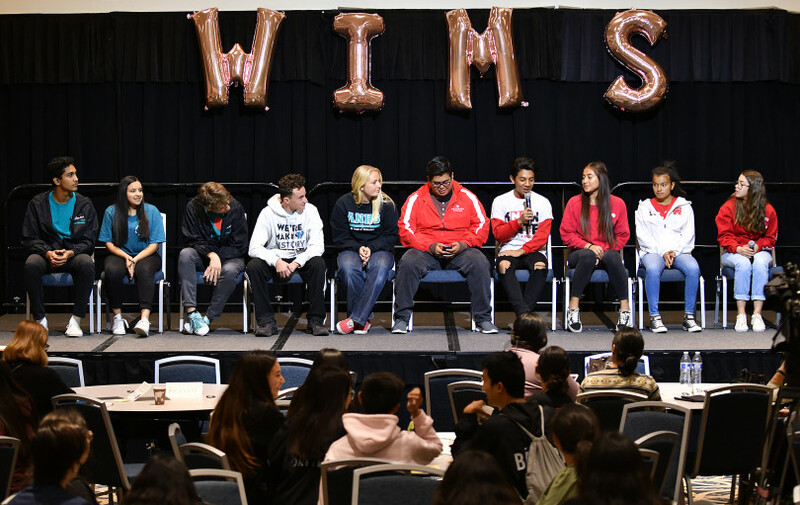 They shared their experiences at the 30th annual Walk in My Shoes youth conference at Cal State Fullerton hosted by OC Human Relations, the nonprofit that also helped facilitate a meeting between students from both schools at UC Irvine on Oct. 30. Shaulyn Barban, a senior at Santa Ana High, said walking into that room for the meeting, he had expected a contentious debate. Barban and others were also told that the “Trump 2020” posters were put up as a joke. 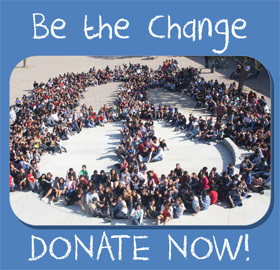 Audrey McKeon, Aliso Niguel’s ASB president, said she felt responsible for the controversy. And that was exactly what she learned during the dialogue at UC Irvine, McKeon said. 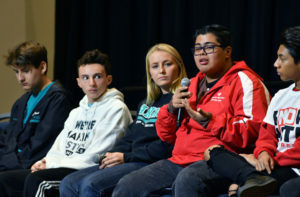 The word “sorry” was uttered a number of times by students from both schools, but no one felt the need for a formal apology, McKeon said. 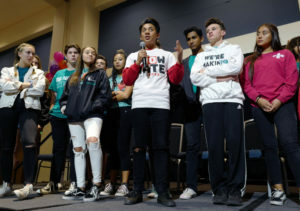 Students from Aliso Niguel expressed remorse for failing to be sensitive to the visitors’ feelings. Barban said he and others from Santa Ana High thought this issue could’ve been simply resolved without getting dragged into social media. 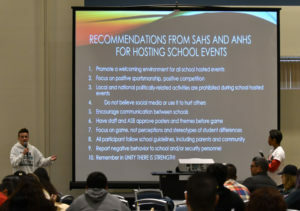 Alison Edwards, executive director of OC Human Relations, said she reached out to the high schools’ administrators soon after the incident volunteering to set up a dialogue. By the end of that three-hour session at UC Irvine, friendships were formed and kids were exchanging Snapchat and Instagram information, and talking about staying in touch and continuing the conversation, McKeon said. Oscar Santos, a senior and member of Santa Ana High’s band, said he was frustrated when he saw Trump campaign posters at the Sept. 8 football game. And, he added, social media often can’t do what direct, face-to-face communication can accomplish. Social media often makes things worse, he said. “The important thing is getting to know the real person instead of making assumptions or jumping to conclusions,” Santos said. Alyson Shon, a senior at Aliso Niguel High, said she is of Filipino descent, but didn’t quite understand the kind of effect a Trump poster might have on a young Latino person. 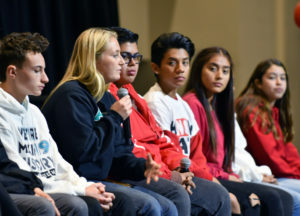 Without making an apology, Aliso Niguel High School ASB president, Audrey McKeon speaks to Santa Ana High School students. Santa Ana High School drum major, Shaulyn Barban and students from Aliso Niguel High School share their experience. 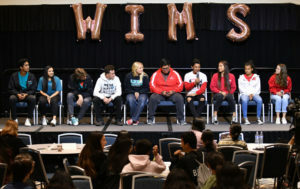 Santa Ana high school student Oscar Santos speaks with students from Aliso Niguel High School and Santa Ana High School as they share their experiences. 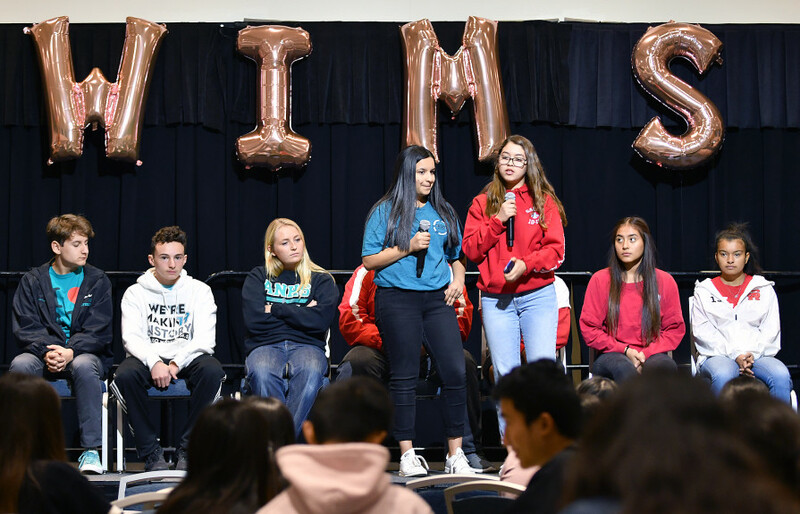 Students from Aliso Niguel High School and Santa Ana High School prepare for a workshop called, “Walk In My Shoes” Friday, Nov. 16, 2018 at Cal. State Fullerton.